I have been procrastinating again Blog. I should’ve written and uploaded this entry days ago but training, making a living and spending QT with the family kept me away from you. Well, today is your day. My friend Cicel Reyna, Caryang to me since kindergarten, told me that she was organizing this Triathlon event in Dagupan, Pangasinan. She insisted that hubby & I should join having been raised in Dagupan. Ahhh, Dagupan my hometown, the Bangus capital of the Philippines (or I could say, the world), the place where my grandparents and parents lived, so many memories, so much love… So of course, how could I miss it? 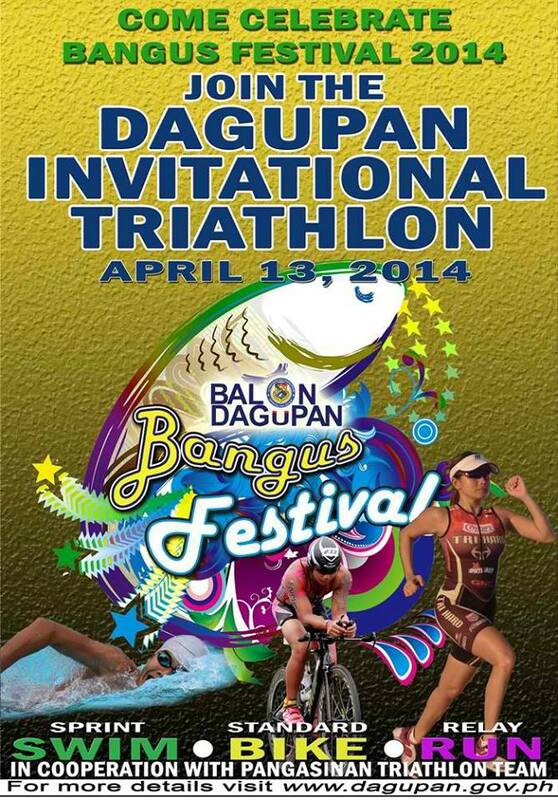 Dagupan Invitational Triathlon. See that gal running? That’s Cicel Reyna. Haha! Registration was a breeze. Since the event had the city’s support, forms were available for download at the city’s website – http://www.dagupan.gov.ph. Bank deposit and immediate confirmation made it easier. It helped of course that Caryang was there to assist me. Well priveleges of a Dagupeña plus knowing her since I was in Kinder. You see, she’s my younger sister’s BFF. Since Dagupan was a very familiar place, hubby was open to bringing the kids with us – particularly our 8yo Chito, which is a first. We never bring the kids on any out of town races. He doesn’t like leaving them in the hotel. But seriously, they’re really missing a lot. I mean who wouldn’t want unlimited access to room service right? So off to Dagupan we go with the whole gang. Bringing my 8yo = bringing his Kuya (+1), his Yaya (+1), his driver (+1.5) haha! Since the van was still in the shop for it’s long overdue maintenance, Chito’s Godfather Ken, my male BFF lent me his ride. 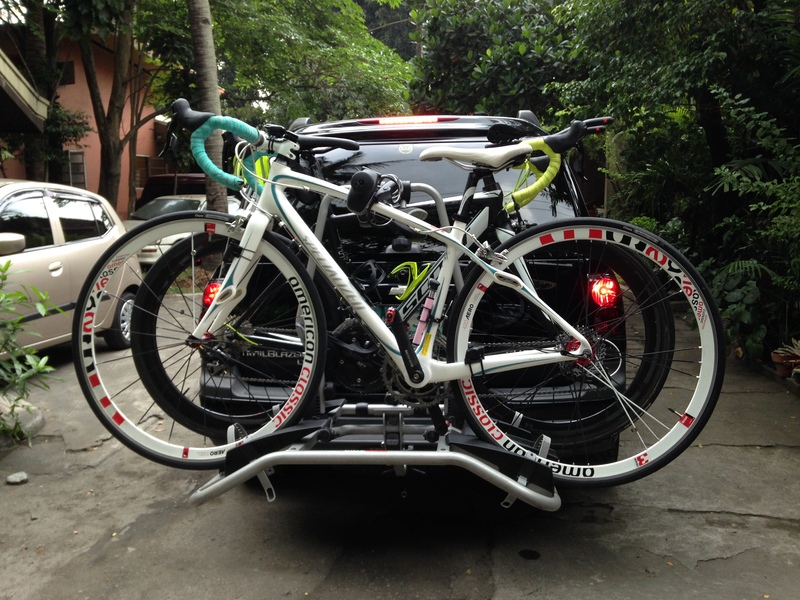 And another of my 8yo’s Ninong lent me his bike rack. Cool! Thank God for Godparents! Hehe! 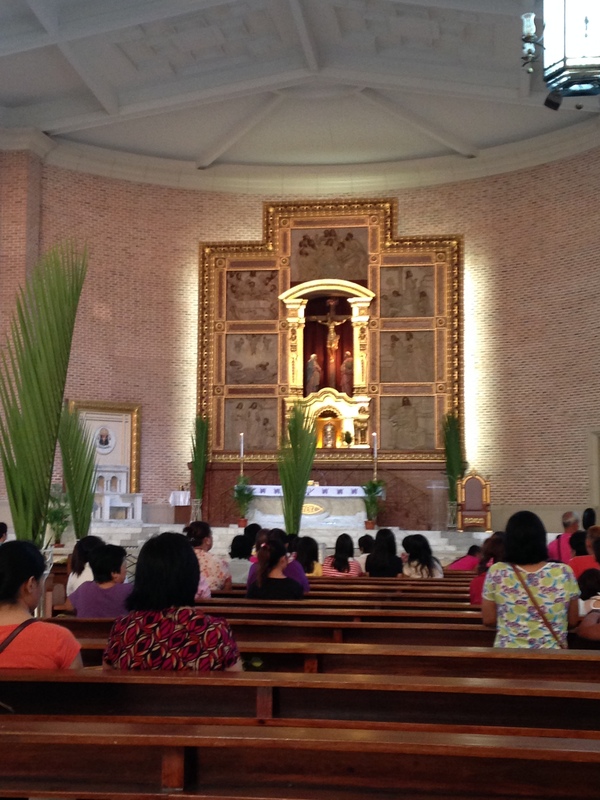 After visiting the resort’s water park, we headed into town to hear mass. It was Palm Sunday the next day so it was a MUST for us to attend the anticipated mass, knowing fully well that we may not be able to partake in the Eucharistic celebration after the race, the next day. At the St. John Cathedral. The place where I was baptized. We headed to St John Cathedral. This is where I was baptized. It was so surreal to be hearing Palm Sunday mass in this church after probably 25+ years. It’s still a beautiful church. I imagined my parents and grandparents were with me and my family, hearing mass as well. After mass, we went to CSI Stadia to pick up our race kits. I haven’t been home in ages that I didn’t even know there was such an establishment. Cool! Easy peasy. I was in and out in 10 minutes. It could’ve been lesser but I chatted for a few minutes with Caryang, saw an old classmate from grade school – Jesus, and chatted a bit with Raul Cuevas of Bike King. After picking up the kit, we needed to get our timing chips and deposit our T2 items (run bag – shoes, socks, gel, towel and of course a comb) I knew that I had to bring this because the organizers sent us an SMS in advance to let us know. A definite plus. With our kits, came a packed dinner of roast chicken, two cups of rice, veggies and fruits – I actually can’t recall what else was in the dinner pack. No visit to Dagupan would be complete without eating in Dagupaña, one of the best restaurants ever. My childhood bestie’s family owns the restaurant. Must try would be their sizzling boneless bangus steak, sinigang na hipon (made from real tamarind), bangus sisig and pinakbet. Even my 8yo loves Dagupeña! Try their Bangus belly pesto, teriyaki and boneless bangus steak. You can buy these from any Terry’s Selection outlet. Thank God I have access to great Bangus in Metro Manila. We headed back to the resort after dinner to prepare for next day’s race.